Home / Why are Self-Efficacy and Personal Agency Such Important Factors to Address in Health Care? What are barriers to patients being able to take charge of their health and successfully manage their health? There are psychosocial factors such as depression, stress, lack of resources, etc. There are still traditional views held by both clinicians and patients that encourage patients to be a passive recipient of care. And there are constructs such as self-efficacy and personal agency that also play a significant role. As one example of low self-efficacy, many patients realize that quitting smoking is important to their health, but, based on their previous attempts, lack the confidence that they can quit. This lack of confidence blocks their feeling of empowerment and may keep them from even trying to quit again unless this sense of low self-efficacy improves. In the context of behavior change science, it is the belief that what I do matters and has an influence on my health – if I walk daily, I can help my blood pressure go down. An example of a patient with low self-agency is a woman with diabetes who does not take her prescribed medications or check blood sugars regularly because she does not believe doing so will make a difference or avoid the set course of her disease. It is quite common to encounter patients/clients in various healthcare settings with low self-efficacy and/or personal agency. In a follow-up study to our clinical trial,10 we compared/contrasted perspectives and beliefs between employees with chronic conditions who had declined to join a free health management program (non-adopters) with those who had joined the program (full adopters).11 We collected both quantitative (survey) and qualitative (focus group and interview) data, and found that the non-adopters had lower levels of self-efficacy and personal agency. It is important to note that there was no difference between the two groups about their belief in the importance of health to one’s quality of life. In addition, the full adopters freely discussed and focused their attention on motivating factors to make healthy lifestyle choices, whereas the non-adopters were more overwhelmed by/focused on perceived barriers and challenges to chronic disease self-management. In a previous blog article, we made the case for the efficacy of MI and the many benefits of integrating into your healthcare setting. Being able to use this approach to address a patient’s self-efficacy or personal agency to help activate proficient MI practitioner will naturally do this, it can be helpful to include this specific application to health coaches during initial MI training as well as during subsequent advanced and skill-building activities. In traditional patient education encounters, when it becomes apparent that a patient has not been following the treatment plan, there is a tendency for the clinician to repeat instructions and/or focus on conveying the importance of the lifestyle change or treatment plan. In the MI approach, instead of automatically assuming that the sticking point is lack of knowledge or lack of belief in importance, the health coach is trained to use one of multiple strategies to assist in identifying individuals who have low self-efficacy or personal agency. Once the health coach is aware that a patient is low in one or both constructs, there are also multiple MI strategies to help the individual improve in their belief that their efforts will make a difference and that they can be successful when they decide to undertake these actions. See Table 1 below for an overview of some of these MI strategies. It is common for patients to appear as if they are in precontemplation phase for adopting a new lifestyle or following a treatment plan; instead, they may lack the confidence or belief that their efforts will make a difference. 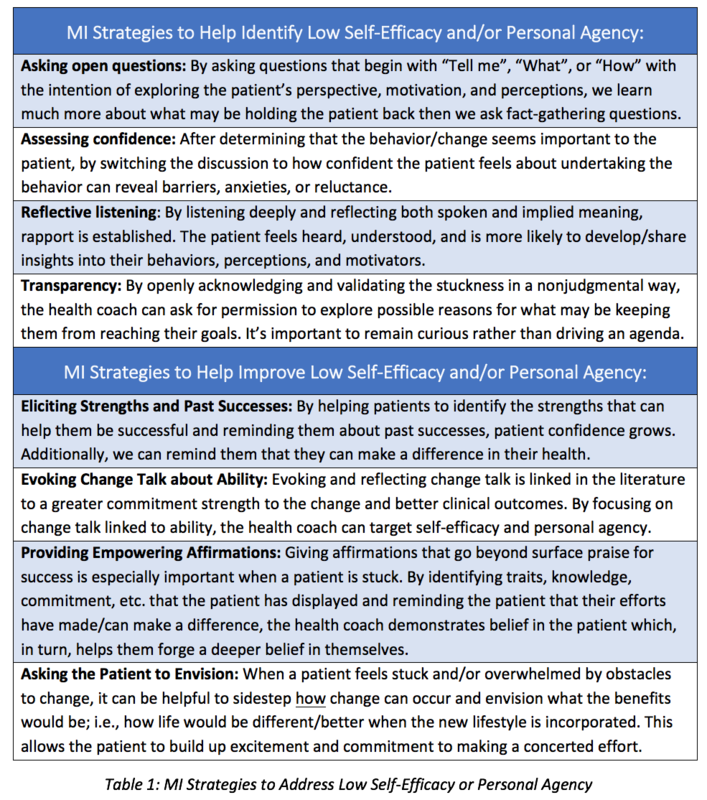 By identifying what the sticking point is for the patient and using MI strategies to address low self-efficacy or personal agency when warranted, we can encourage individuals to believe in themselves and empower them to begin to take charge of their health. 1 Hibbard JH, Stockard J, Mahoney ER, et al. Development of the Patient Activation Measure (PAM): Conceptualizing and Measuring Activation in Patients and Consumers. Health Serv Res 2004;39(4p1):1005-1026. 2 Linden A, Butterworth SW, Prochaska JO. Motivational interviewing-based health coaching as a chronic care intervention. J Eval Clin Prac 2010;16(1):166-174. 3 Linden A, Butterworth SW. A Comprehensive Hospital-Based Intervention to Reduce Readmissions for Chronically Ill Patients: A Randomized Controlled Trial. Am J Man Care 2014;20(10):783-792. 4 Skolasky RL, Maggard AM, Li D, et al. Health Behavior Change Counseling in Surgery for Degenerative Lumbar Spinal Stenosis. Part I: Improvement in Rehabilitation Engagement and Functional Outcomes. Arch Phys Med Rehab 2015;96(7):1200-1207. 5 Lorig KR, Hurwicz ML, Sobel D, et al. A national dissemination of an evidence-based self-management program: a process evaluation study. Pat Educ Couns 2005;59(1):69-79. 6 AbuSabha R, Achterberg C. Review of self-efficacy and locus of control for nutrition- and health-related behavior. J Am Diet Assoc 1997;97(10):1122-32. 7 Bandura A. Self-Efficacy Mechanism in Human Agency. Am Psychol 1982;37(2): 122-147. 8 Bandura A. Social cognitive: an agentic perspective. Annu Rev Psychol 2001;52:1-26. 9 Feldman G. Making sense of agency: Belief in free will as a unique and important construct. Soc Personal Psychol Compass 2017;11(1):e12293. doi: 10.1111/spc3.12293. 10 Prochaska, J.O., Butterworth, S., Redding, C.A., et al. (2008). Initial Efficacy of MI, TTM Tailoring and HRI’s with Multiple Behaviors for Employee Health Promotion. Prev Med, 46, 226-31. 12 Goldin PR, Ziv M, Jazaieri H, Werner K, et al.Cognitive reappraisal self-efficacy mediates the effects of individual cognitive-behavioral therapy for social anxiety disorder. J Consult Clin Psych 2012;80(6):1034-1040. 13 Butterworth SW, Linden A, McClay W. Health Coaching as an Intervention in Health Management Programs. Dis Manage Health Outc 2007;15(5):299-307. 14 VanBuskirk KA, Wetherell JL. Motivational Interviewing Used in Primary Care: A Systematic Review and Meta-analysis. J Behav Med 2014;37(4):768-80.